We are sometimes asked what our ‘Desert Island’ plant would be and the reply sometimes suprises customers. This month we have opted for the Viburnum tinus ‘Eve Price’ for our Plant of the Month, a plant which does everything you ask of it beautifully and without fuss. It will grow in the shade or full sun, doesn’t mind clay or sand soil and is loved by birds for its nesting potential. At this time of year this Viburnum is covered with glorius white flowers which is just what you need when Spring has arrived one day and then gone the next. The picture you see above is one we grow as a hedge in our garden and it provides great , evergreen screening where it is needed. 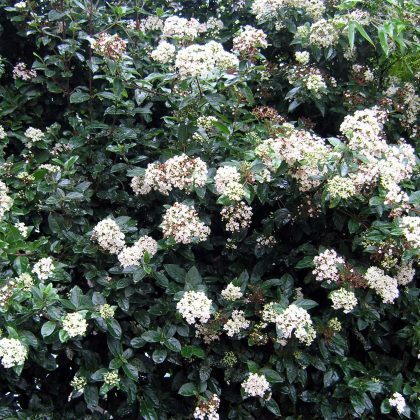 So don’t dismiss this often overlooked, versatile shrub which can be clipped to a size to suit the space available and will reward you with its adaptability.